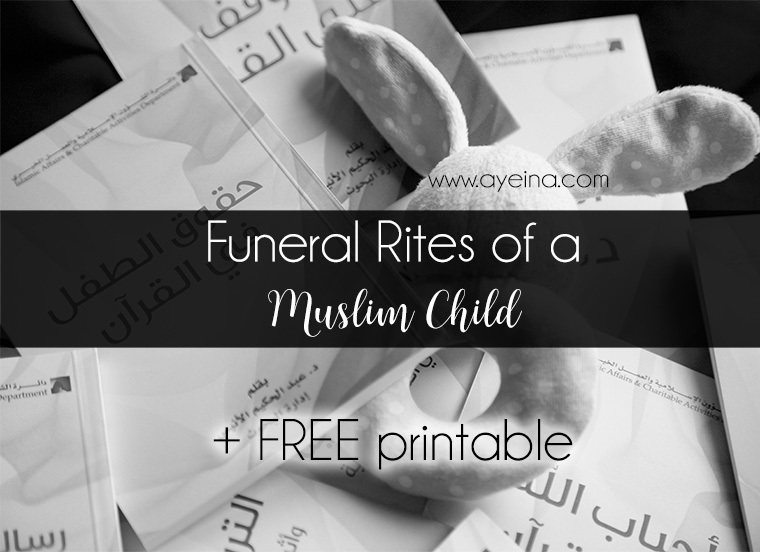 Having gone through this first hand – after my sister and my best friend (who’s also the co-founder of AYEINA) lost her son, it made me realize how important it is to know the formalities that come with the deceased. Especially a child. Because most people don’t know how the funeral of a child goes. They’ve mostly seen funerals of adults. And if you reach out, most people won’t have the knowledge of how a funeral is carried out. Especially when it comes to its practical application. Although we read the topic of death in detail and even took its exams when we were doing our Qur’an course. But there we were, frantically going through the pages of the book (“mera jeena mera marna” – a book in Urdu) while trying to absorb the reality of death. We had forgotten some parts because we never got to apply the knowledge we were given. Even though it was a part of the course to practically teach the students all the funeral rites. Go listen to the audio linked in the Arabic text above. “Indeed we belong to Allah , and indeed to Him we will return” rang true in so many ways. Because death – it waits for none. No matter how young, no matter how old. It’s the worst nightmare for any parent out there but it’s a reality so many parents around the world go through. Parents in Syria, Palestine, Kashmir, Rohingya among many others, face such calamities every day. Some even multiple times a day. It takes some time to swallow the bitter pill of reality – especially if the news come to you unexpectedly. Everything around you becomes so irrelevant and unimportant. The world starts to feel like an actual temporary place to live in. Something that we often forget amidst all the luxuries. The term “what will the people say” become an extinct thought at that moment. You don’t care how you look like or the unanswered notifications adding up in your mobile. You don’t care about anything worldly at that moment. Accepting that death can come to anyone anytime is the first step towards being able to practice patience at the first blow of such calamity. Tears are a completely natural phenomenon in grief whereas crying out loud and wailing are contrary to patience and are not permissible. In that moment, you may hear people consoling you with all sorts of words. Some may say things that may be displeasing to Allah and staying grateful in all circumstances becomes harder that way. Remember that the innocent souls of children will directly go to Jannah in shaa Allah – without any questions asked. That’s one part of satisfaction you have when you lose a child. You know that they are in better hands than yours. Better embrace than yours. Better care than you could provide. And definitely, a better place than this world has to offer. Letter to My Sister’s Stillborn Fetus and Hope Amidst Tragedy. 1) informing close people around – those who can help and offer a warm shoulder. 2) closing eyes/mouth of the deceased. 3) taking the body to a place where one may need to give the ghusl and wrap in a shroud etc. – most probably your home (if you aren’t already there). 4) arranging the kafur (camphor)/lote-tree (sidr) leaves etc. for the ghusl. 5) bringing the kafan/shroud (burial sheets). 6) sending a person to the graveyard so a child’s grave may be dug. 7) asking the mosque’s Imam nearby for the funeral prayer timings etc. Although generally, the relatives of the deceased must hasten in paying back any debts from whatever wealth the deceased has left behind but of course, for a child – that’s not required. As a general rule, males should take the responsibility of washing males, and females should wash females. The only exception to this rule is in the case of husband and wife, or small children. This and all the next steps are probably the scariest of all. When you touch a body that has turned cold, it makes you realize the worth of a soul. The vessel that holds it turns into a scary reminder of death as you arrange a table to lay the body of the child on with your trembling hands and do ablution (wudu) to give the deceased a bath. 1) Removing the clothes (and cutting whatever clothing is difficult to remove) and keeping the body parts that are not being washed – covered with a towel/open cloth piece. 2) Applying slight pressure to the abdomen to expel any impurities. 3) Washing the private parts. 4) Washing the parts of the body that are washed in wudu. 5) Pouring water on right side of the body and then the left – 3, 5 or 7 times – first with sidr (lote-tree) leaves and the final washing should have some perfume in it, such as camphor or the like. 6) Drying the body/Clipping the nails/combing the hair etc. to get the body ready for shrouding. Nothing reminds you of hereafter more than this step. The Prophet (ﷺ) was shrouded in three sheets. The preferable color of the shroud is white. It is not permissible to be extravagant in shrouding the dead. The sheets should be ordinary cloth, and the number of sheets should not exceed three. It is recommended that the shroud is perfumed with incense, except in the case of a person who died in a state of ihram. 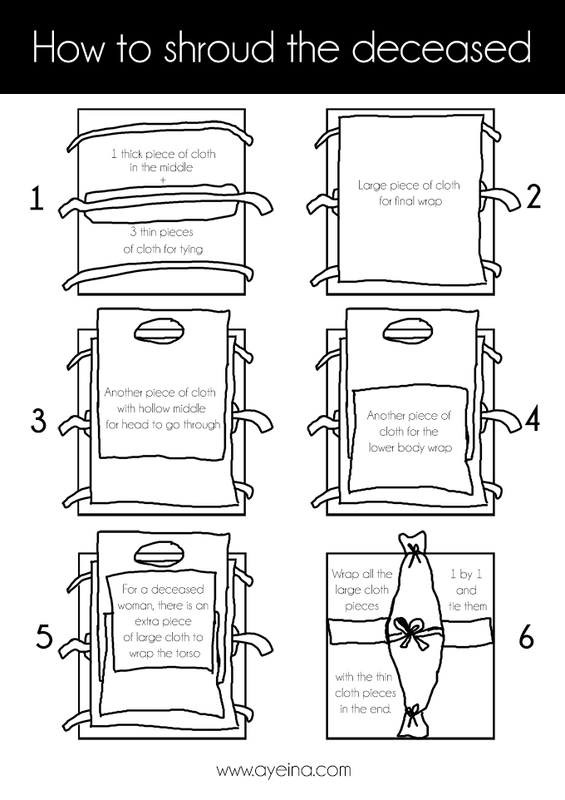 How to wrap a body is the most confusing part – mostly because your brain is really not present there and you feel that your limbs are simply doing what they’re supposed to do at the given moment. Your mind is somewhere else – away from this dunya. I’ve illustrated the following on my own with the help of the illustration in the book “mera jeena mera marna” and translated it into English – Please feel free to print it out. Hope it helps. The shrouded body is then taken for Salaat-ul Janaazah which is a communal obligation – Fard Kifaayah. Hence one can inform all those who can attend the funeral. Relatives living in the same city, neighbors etc. It also gives you a sense of community alhamdulillah. How people gather when you need to hold the warm hands the most. This is the moment when reality actually hits you and if you haven’t shed tears all this time, the funeral prayer leaves your vulnerability wide open. The funeral prayer is in the form of a congregation. The Imam stands facing the Qiblah behind the head of the deceased man and behind the middle of the deceased woman. 1) After the first takbir, Surat al-Fatihah is recited silently. It is also permissible to recite another small chapter after it (if the time allows). 2) After the second takbir, the prayer for the Prophet (s.a.w) should be made. Allahumma a’idhhu min ‘adhab al-qabr – (O Allah, protect him from the torment of the grave). 4) After the final takbir comes the tasleem – giving greetings of salaam, as one does in regular prayer (salaat) to conclude their prayer. One may do so by making tasleem to both the right and left sides, or the right side only. If you’re a woman, you may not get to see the deceased being buried six feet underground so funeral prayer may feel like a final goodbye. But please make sure that you inform those who are burying the child (or even an adult) that the grave is not elevated or decorated with etched tombstones etc. What the deceased benefits from, are your duas. Most cultures around the world don’t have such customs hence no one may send you the dish. I personally made it myself the next day. I followed THIS RECIPE for Tharid (although I didn’t add all the garam masala etc. – kept it as simple and digestible as possible). You can follow THIS RECIPE for Talbina. 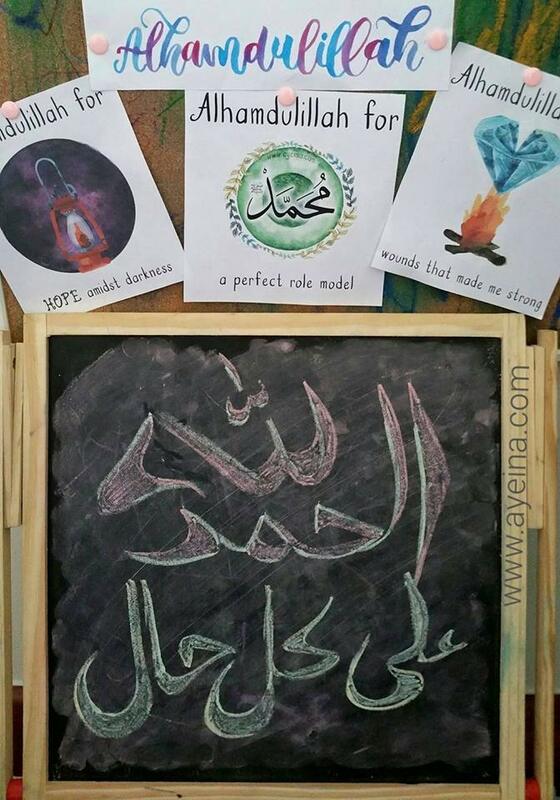 The Islamic term for mourning is Hidaad. Mourning for more than three days is not permitted except in the case of a woman whose husband has passed away (iddah of 4 months and 10days). I love how Allah allowed the natural feeling of grief but didn’t let us wallow in it so much that we forget to do anything for the deceased or ourselves. The yearning to hold him in your arms once again keeps you pushing forward. May Allah help us all enter Jannah with easy reckoning so we may all unite with our loved ones that we dearly miss in this world. Its very informative and tugs a chord of ones heart! I hugged my toddlers and imagined how painful it must have been for the mother to lose her baby! Yet many mothers go through this! To Allah we belong and to Allah we return. So, so sorry to read of your loss. It is incredibly generous of you to share this knowledge with others who may need it during the most difficult trial of their lives. Thank you so much for everything you do, and for the value that your site gives to your readers. I’m so sorry for your and your sisters loss. I’m 2 weeks away from my due date and reading about this hits me with the truth of reality and life. At the same time, my heart beating harder than usual, steadily… feeling scared. It’s as if the “out of this Dunya” feeling, that which you are talking about, is there already. Very informative and a good article to even have printed or kept somewhere. First accept my condolences….I know how difficult it is to write up this post….Allah SWT bless you all with Sabar….It is very useful post for many…. JazakAllah Khair for this informative post at such a hard time. My love and duas are with you both as always. My sister miscarried twice and we lost my brother in his twenties…but I have never really learnt the funeral procedures as all this happened when I was in my early teens. Seeing the body of my brother had such a negative effect on me that I actually now try to avoid seeing the person who has passed away at funerals…it may be wrong to do that but it is for my own state of mind. Death of loved ones can leave long lasting effects at times and if painful wounds are cut open due to a certain scenario, it’s best to avoid indeed. It’s scary but it’s a great reminder that we all shall return to HIM one day. Inna lillahi wa inna ilaihi raji’oon. My heart goes out to every mother that lost a child. Writing something so detailed at a time like this must have been uneasy. I appreciate it. My first time praying in the funeral prayer was in the haram and i have been unable to memorize the long du’a i found…so jazakillahu khayr 😊. Although it’s mainly used for kids but sometimes there’s not much time between takbeeraat so this is conveniently recited alhamdulillah. Extremely sorry to hear about the loss. May Allah bless your sister and the entire family with patience. This was a very informative piece. Thank you for gathering all the information and adding it to my knowledge. Aslam Alaikum sister ayeina, my sister(cousin but she is super close) had a baby the 28th of September alhamdullilah(praise Allah) but he was very sick they took a lot of tests and they found out he had some genetic mistake in his body the doctors said, and made the mother cry out every time he was in pain. He passed away 2 days ago. I’m wondering how do I support her and what is the consoling things to say? He was constantly in pain when he was in this Duniya so I’m grateful to Allah azzawajal to free him of that and I will fight and do my best to meet him again in Jannah. But will this really give her any hope does this really strengthen her iman? SubhanAllah this is such a reminder of how fleeting life is and how our children are not ours but simply an amanah from Allah given to us for a short time. Sis maa shaa Allah I can imagine how hard it was for you to write this, but I honestly think it was such a great and genuine thing to do. I have never been to an Islamic funeral and have no idea how any of that works so it was helpful and informative for me. I also loved how it wasn’t just all inforamtion but you added important reminders about death and duniya. You and Ayesha and family are in my duas. You discussed a very important topic in simplest way. Great post! Salaam. When my 5 month old nephew died we were almost discouraged from reading the quraan, yaaseens and thikr as pure little innocent souls don’t need help finding their way to Jannah (as you mentioned). However, i found that it is more a comfort for the readers than a gift to the departed. I read over the words Salaam-un qawlam mirrabirraheem in Surah Yaaseen (which roughly translates to “Peace, a word from the Merciful Lord”) which is how the angels will greet all the purest souls who enter heaven. It provided me with more comfort than any of the words of consolation people had for me. So i would advise people to do the same. For contentment of one’s own heart. It is INDEED more of a comfort for the readers than a gift to the departed. Beautifully put! The deceased can only take what’s his/hers to take from this world – which is – their good deeds, duas and sadaqah jaariyah they did in the world that continues even after their demise (be it in terms of money or knowledge etc.). (O Allah), Guide us to the straight path; The path of those whom you have favored; Not those with whom you are angry; Nor those who go astray. Really sorry for your loss.. subhan Allah you’ve shown immense courage and at the same time helped many broken hearts to heal and strengthen their faith with your beautiful lines.may Allah make us his righteous slaves and give us the ability to accept his decree..